A caravan rumbles to a stop in the backwoods, and teenagers jump out, landing in scratchy knee-high grass. It is just past 10 p.m. The brush hisses in the wind beneath a black-marble sky pulsing with stars, as seven high school students from New York City follow the call of the ocean toward a secluded beach in Puerto Rico. Trekking through the thicket in the Northeast Ecological Corridor, a stretch of coast just north of El Yunque rainforest, they spot waves in the distance. A cooling breeze rolls off the sea as the students remove their shoes, bare feet sinking into the tepid, silky sand. Abril De Los Santos, 16, notices a pole poking out of the sand, its tip wrapped in bands of red and blue. She cautiously steps around it, and later is glad she did. The pole, she will learn, was put there by a marine researcher to mark the nesting site of an endangered leatherback sea turtle. "No iPods, no cell phones, please," a guide warns. "If there are lights, the turtles get confused." The group obeys, also stashing cameras and dousing flashlights. Moon and stars will light the way from here. "We will wait," the guide tells them, pausing near the water. "If the turtles see people too close to the shore, they will turn around." The teenagers--six girls and a boy--and their chaperones drop backpacks, unroll beach towels, and ready themselves for a long night. They will sleep on the beach if they have to, anything to witness the world's largest species of sea turtles--some weighing up to 2,000 pounds--venture ashore at high tide to lay eggs. 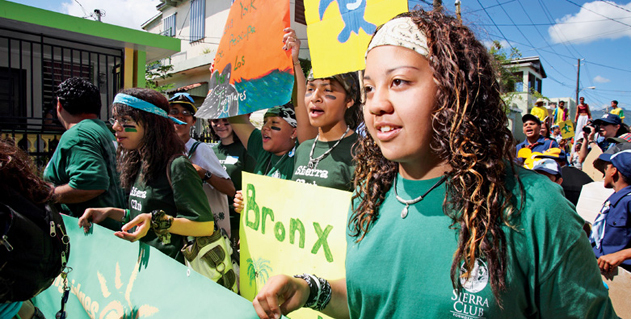 A long way from home, New York City high school students take to the streets of Luquillo for the fourth annual Leatherback Turtle Festival. The students have traveled to Puerto Rico as part of an alternative spring break project run by the Sierra Club's Building Bridges to the Outdoors program. They've come for the chance to hike through a rainforest, feel a waterfall tumble over their faces, and kayak through a bioluminescent lagoon. But a more pressing mission underscores their trip: raising awareness about saving leatherback turtles, a species that has roamed the planet's sea and shores since the days of the dinosaurs. Today leatherbacks are nearing extinction, and even on this seven-mile beach in the 3,200-acre ecological preserve, they still face the threat of losing their nesting habitat to commercial development. Before the trip is over, the students will hold a press conference and march in the Leatherback Turtle Festival. But first they yearn to lay eyes on just one leatherback. Perhaps they will be lucky enough to hear a mother turtle grunt and heave as she treads across land. Or to watch as she tosses piles of sand with the powerful strokes of her back flippers in a ritual known as the "turtle dance," methodically digging a pit big enough to hold her eggs, each the size of a billiard ball. Abril De Los Santos, at home in the Bronx. Just off an expressway in the Bronx, nine brick buildings stand on a concrete-and-grass island encircled by road. These are the Bronx River Houses, home to 3,000 low-income residents. Abril De Los Santos, a Bronx Lab School student, lives here with her family. Their three-bedroom apartment, on the top floor of a building with an unreliable elevator, is a refuge from the big-city blight, its walls adorned with vibrant paintings and photographs that tell social and political stories. As a child, Abril--named after the April 1965 revolution in the Dominican Republic--was often carted by her parents to rallies in support of gay rights, worker rights, and immigrant rights. Her bedroom door is wallpapered with pictures of Frida Kahlo, Angela Davis, and Rigoberta Menchu. But it wasn't until recently that her activism took an environmental turn. "If the world you live in is crumbling," she asked, "where are you going to live?" Abril was looking forward to learning more about Puerto Rico's ecological challenges, but she understood that a lifetime of activism awaits in her own backyard. 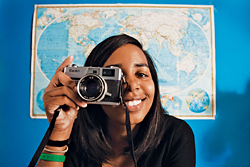 She inherited her father's passion for photography. Her images, taken with her beloved 35mm camera, show the Bronx in shades of gray. Among her favorites: an impoverished neighborhood woman feeding dozens of stray cats in an abandoned lot. "We're getting pushed out of our communities and people are getting laid off," Abril said on this drizzly afternoon. In the next room, her mother shelled peanuts and listened to Spanish folk music. But problems in the Bronx extend beyond poverty. "It's polluted, and you can't breathe," she said. "People are getting asthma and they are getting sick." Indeed, death rates from asthma in parts of the Bronx--home to a sewage-treatment plant, fume-spouting factories, and exhaust-choked expressways--are about three times higher than the national average. Abril wondered, How can a young person like herself stop the demise of her neighborhood? That question, it turned out, would be partially answered in Puerto Rico, where community activists challenged recent plans to supplant the leatherbacks' nesting habitat with two resorts that would have included golf courses, 700 hotel rooms, and 4,000 luxury residences. The Sierra Club's Puerto Rico chapter helped organize residents seeking to protect the ecological corridor, inundating Puerto Rico governor Anibal Acevedo Vila's office with thousands of e-mails, postcards, letters, and schoolchildren's drawings. It was a battle the activists won on October 4, 2007, when Vila signed an executive order to establish the natural reserve. Photos, from left: A trash-cleaning trek through El Yunque National Forest. Flippered hatchlings such as this were the reason behind the students' Caribbean excursion. Investigating the island's curious flora. The morning of their turtle-seeking expedition, Abril woke at 5 A.M., along with Jeanelsy Rodriguez, 16, a student at the High School for Leadership and Public Service, a Lower Manhattan campus whose lunchroom overlooks Ground Zero. Groggy, the two girls crept outside to watch the sun rise over the Atlantic Ocean from the balcony of a rented beach house in the town of Luquillo, population 20,000. Abril snapped photos as the tangerine hump on the horizon swelled, coloring the leftover night sky from aquamarine to robin's-egg blue. In her photographs, distant tree-covered hills peek from behind the ocean's lip. The hills are part of the Northeast Ecological Corridor, where the students would wait for turtles later that night. They spent the previous day in the same preserve hiking and picking up trash: beer bottles, Jolly Rancher wrappers, plastic cups. "I'm pretty sure you wouldn't treat your house this way," said Bronx Lab student Jazmine Benoit, 14, after the hike. "Earth is your house." Garbage that accumulates onshore or drifts in the sea is harmful to turtles, the students have learned. It collects alongside seaweed, and turtles often mistake plastic items for jellyfish, their favorite food. On the cleanup hike, Jonathan Cabal, 15, a lanky Bronx Lab student, had stopped to take in the view. "It was so beautiful, the ocean so pure," he said. "I imagined it with hotels and private houses. It just wouldn't be the same. It would have turned something so beautiful into something just average." The attempt to create a leatherback safe zone in Puerto Rico is part of an ongoing worldwide turtle-conservation effort. Although the leather-backs have been listed as endangered by the United States since 1970, their migratory patterns add to the preservation challenge. They are the most wide-ranging sea turtle and have been driven nearly to extinction in the Pacific Ocean. The number of adult female leatherbacks worldwide has fallen from 115,000 to 25,000 in the past 30 years, according to the U.S. Fish and Wildlife Service. Nesting sites remain under siege, and in the ocean the turtles are threatened by long-liners, gill netters, pound netters, and shrimp trawlers. Even without the manmade perils, the leatherback's journey is treacherous, and it begins before birth. Headlights pierce the night. The students watch as the bright beams travel through the woods, down to the sloping beach, and toward their makeshift campsite. They have entertained one another during their long wait by imitating the turtle dance, flailing their arms and legs like flippers, sending sand spraying through the air. It would be incredible to see a turtle, says Jonathan. But even if he doesn't see one, he will savor this break from the stresses of home. He shares a Bronx apartment with his grandmother, mother, sister, and two brothers. His father recently left home, and Jonathan hasn't spoken to him lately. Jonathan feels furious when he is cooped up too long in the crowded apartment. But there are few places outdoors for him to roam safely, he says. "Just living in the Bronx is hard," he says. "There really isn't a lot of opportunity, and going to school is a battle itself. There are criminals, gangs, and all these dangerous things you can bump into on the way." Jonathan wants to become a broadcast journalist, but right now his main focus is to get to college. "It's really my determination," he says. "I don't see myself going down a bad road. I will only let myself go down the right one." The headlights close in. A jeep stops and Hector Horta, a local wildlife biologist, climbs out. For 24 years, he has been studying the Northeast Ecological Corridor, and now he's in charge of turtle monitoring for the Puerto Rico Department of Natural and Environmental Resources. Horta explains that his colleagues are out surveying the beach for signs of turtle nesting. In the past month, they have found evidence of nearly 100 nests. Horta has recorded more than 400 nesting sites in a single year, and as few as 250. If they find one tonight, he says, they will summon the students. This is the students' chance to ask an expert anything they want about leatherbacks. They surround him. "How does the turtle know which are false eggs?" asks Shaila Gomez, 17, a student at the High School for Leadership and Public Service. "She doesn't," says Horta. "She can't tell." The mother lays 60 to 120 eggs, about 80 percent of which are fertile, he says. Incubation takes about 60 days. "What are some of the dangers the turtles face on the beach?" asks David Veliz, the Building Bridges to the Outdoors youth coordinator who helped organize the trip. "Mostly the danger is coming out, laying the eggs, and going back," Horta replies. Biologists estimate that only 1 in 1,000 hatchlings survive to become female adults, he says. Raccoons, rats, cats, and other animals often ravish the nests before the eggs even hatch. If a nest survives long enough for a baby turtle to emerge from its egg and crawl out of the sand pit, the hatchling then must find the ocean. It relies on the light of the stars and the moon reflected off the water to find its way. Artificial lights from hotels, streets, and homes can lead them off track. Meanwhile, foxes, seagulls, and dogs hunt them as they make their slow way to the sea. "How do you help them get to the water?" Abril asks. "As wildlife biologists, we try not to make contact with the species," Horta says, explaining that they try to supervise, observe, and count eggs without disturbing the hatching process. When the questioning ends, Horta tells the group, "Let's wait and see what happens tonight." The students are sprawled in the sand, exhausted but giddy. They stare at the sky, shouting out images they see in the stars. "I see a whale," says Abril. "It looks like someone running," says Jonathan. "An abominable snowman," says Shaila. Veliz approaches and asks, "How are you doing on a scale of 1 to 10?" "I'm at 20," says Abril. "I'm, like, at cloud nine, yo," says Jonathan. They feel like they could stay forever. But it's getting late. The chaperones are sleepy. And the group has a big day tomorrow, beginning with an early press conference in San Juan. The students pack up their belongings and prepare to head back to the beach house. They have sand in their hair and bug bites on their legs. They did not see a turtle. No eggs. No hatchlings braving their way to the sea. But no one is disappointed. "We got to chill with the stars," says Abril. At a press conference the next morning, Abril tells reporters in Spanish: "Yesterday was one of the most beautiful and emotional days we've experienced yet. Thanks to Building Bridges to the Outdoors, many more students will be able to learn about the ecosystem and how to take care of it." Early the following day, Abril boards a plane to New York City, her camera full of Puerto Rico memories packed securely in her luggage. As the plane lifts, the students gaze through the windows at the island, knowing somewhere below, nestled beneath sand, a baby turtle grows restless inside its shell, preparing to break free. ON THE WEB Speak up for leatherback sea turtles: Urge the governor of Puerto Rico, the secretary of the U.S. Department of the Interior, and the administrator of the National Oceanic and Atmospheric Administration to protect sea turtle habitat. Erika Hayasaki is a former education writer and national correspondent for the Los Angeles Times. She teaches literary journalism at the University of California, Irvine. This trip was financed by the Sierra Club's Building Bridges to the Outdoors program, which aims to give every child in the United States the chance to experience the natural world.